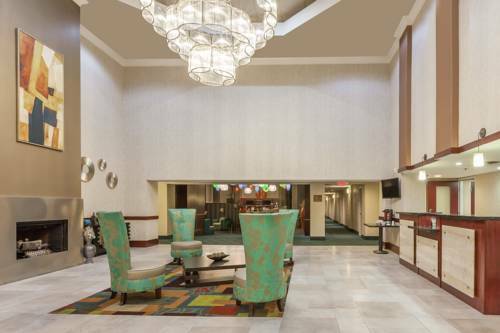 Welcome to the newly renovated Holiday Inn Hotel & Suites Oklahoma City North! When looking for a great hotel in Oklahoma City, youll appreciate our central location to all major businesses as well as a variety of attractions. Our location, just off of Highway I-235 (Broadway Extension) and near I-44, I-40 and I-35, puts you within minutes of everything the city has to offer. Business travelers who need to stay close to their clients will be glad to know that our Oklahoma City hotel is centrally located near Chesapeake, Cox Convention Center and a 5 minute drive from downtown. Within a 5 miles radius you will discover the State Capitol, Amateur Softball Association Hall of Fame, Top Golf, Ifly, DBat, Bricktown, Remington Park and Casino, OKC Zoo, Penn Square Mall. Our full service hotel will provide you with all of the amenities you need including an on-site restaurant and lounge and meeting space for any type of event including weddings and corporate meetings. Guests can choose from various room types including deluxe rooms and suites. All rooms come with a refrigerator, microwave, and Keurig Coffee maker. Wi-Fi is complimentary in all guestrooms and public areas. Business and leisure travelers will enjoy perks like our 24-hour Fitness Center, game room, snack shop, business center, on-site laundry, wireless Internet access, indoor pool and jacuzzi. Rose Rock Grill: Rose Rock Grill/Lounge open daily from 5PM to 11PM. Full Bar, also serving a full menu of American Cuisine. Boardroom: Existing set for 8 people around a conference table. Availability to possibly add a few more seats Basic Wifi included in meeting room rental. Aduio Visual and Catering handled in house. Lake Hefner Golf CourseAlthough a challenging to even the most experienced golfer, we believe golfers of all ages and skills will enjoy the golf courses at Lake Hefner Golf Club. Remington ParkRemington Park is a horse racing track and casino located in Oklahoma City, Oklahoma. Built in 1988 by Edward J. DeBartolo Sr., it was the first world-class pari-mutuel track in Oklahoma. Oklahoma State Capitol ComplexCapitol building has 5 floor levels open to the public, not counting the basement, marble seems to be the stone of the day, and it is shown prominently throughout the building. Cox Convention CenterThe Cox Convention Center in Oklahoma City is a quick walk from the revitalized Bricktown historical district, featuring a variety of new canal-side restaurants. Oklahoma City ZooSpread out over 435 acres, State Fair Park hosts nearly 200 events, annually. Events include: world-class equine and livestock events, conventions, consumer trade shows, sporting events, concerts, banquets, retreats and more. ASA Softball Hall of Fame StadiumASA Hall of Fame Stadium is a 7,300-seat multi-purpose stadium in Oklahoma City, Oklahoma United States. It is located next to and operated by the Amateur Softball Association. It opened in 1987 and is a regular host site for Team USA Softball. Penn Square MallIndulge in brands you love at the best shopping mall in Oklahoma City. Visit Quail Springs Mall in Oklahoma City for shopping, dining, and entertaining. Chesapeake Energy ArenaWatch the Oklahoma City Thunder beat the buzzer at Chesapeake Energy Arena! Arena is located 5 Miles from hotel with easy access to Broadway Extension which is located with an exit directly behind the hotel. Zoo AmpitheaterZoo Ampitheater is located 3 miles from the hotel between Remington Park and OKC Zoo featuring concerts and local events. Lazy E ArenaWestern entertainment facility that is home to more than 25 championship events each year. Tinker Airforce BaseTinker Air Force Base is a major United States Air Force Base, with Tenant U.S. Navy and other Department of Defense missions.